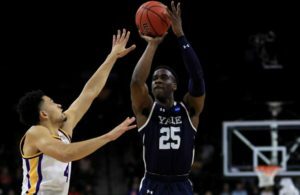 Yale’s Miye Oni scored a career high for the second straight game, surpassing the 31 points he made against Dartmouth last week. Back on his home court, Oni piled up 35 as the Bulldogs handed Princeton its first Ivy League loss, 74-60. Yale (14-4, 4-1 Ivy) is now tied for the league lead with defending champion Princeton and Harvard, which had to go three overtimes to beat Columbia. The Tigers’ (12-6, 4-1 Ivy) three-game winning streak came to an end before almost 2,000, near capacity in the Lee Amphitheater of the Payne Whitney Gymnasium. At the time of his suspension Cannady was averaging 20 points per game. Against Yale he had to shake off the rust and could score but eight points on 3-of-12 shooting. He did not start but still saw 34 minutes of game time, more than any of his teammates. Oni was 13-of-18 from the field, including 5-of-7 three-pointers. He also was credited with 12 rebounds, and three blocks. “Tonight was probably one of the best games I’ve played,” he admitted. The 35 points were the most in a game for a Bulldog since Greg Mangano scored 35 in a win over St. Joseph’s (N.Y.) in 2012. Although Yale took a 36-22 lead at the half, Princeton tied the score 42-42 on Llweellyn’s two free throws with 11:32 left. But the Bulldogs followed with a 10 point run, including back-to-back threes from Azar Swain. However, the Tigers were not through. 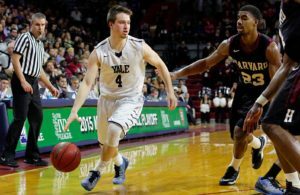 They got as close as 63-60, but Yale held them scoreless over the final 2:34. In a near historic triple overtime, Harvard (11-7, 4-1 Ivy) defeated Columbia 98-96 on Friday at Lavietes Pavilion in Cambridge. 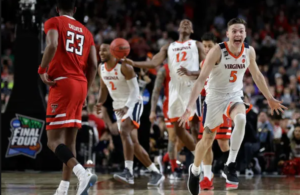 It required a buzzer-beater trey at the end of the first overtime by Bryce Aiken, who had 44-point all told. Before that, the Lions had a similar heroic effort with a last-triple from Gabe Stefanini as regulation came to an end. Harvard stays tied with Yale, as both team closed in on Princeton. The three teams now share the Ivy League lead. Pennsylvania (14-7, 2-3 Ivy League), which lost its first three Ivy games, won its second, 92-82 at Brown’s Pizzitola Sports Center. The Quakers led by 16 early in the second half. Devon Goodman had 21 Bryce Washington 20 points for the Quakers. But Obi Okolie scored a career-high 25 points for the Bears (13-8, 1-4) and Desmond Cambridge added 21. It was a night for spectacular performances. In addition to Bryce Aiken of Harvard (44) and Yale’s Miye Oni (35), Matt Morgan had a career-high 41 points on Friday as Cornell (12-10, 3-2 Ivy) beat Dartmouth 83-80 on the road. In another tough loss for the Big Green, Cornell led by just 77-76 with a minute to play. Morgan made nine of eleven 3-pointers as he became the first Cornell player to score over 40 points in a game since March 5, 1960, when George Farley made 47 against Princeton, still a Cornell record. Morgan shot 13-of-18 overall and 9-of-11 triples. Chris Knight had a career-high 27 points plus five assists and four blocks for Dartmouth (10-11, 1-4 Ivy), who have now lost their last four.